When the Guitar Hero franchise was just in its infancy, we got the chance to work on it. By creating advertising which made the player look like a real rock star, we helped propel it into the incredibly hot franchise it became. Another one of our many credits for Activision. This was an especially fun project for us. Not only did we really like the game – it was ingenious and it was the first of its kind, we had a lot of license to create the sort of ad that we would like to see. We were able to hire models and a photographer and art direct from start to finish. We were pleased with the final results. The ad highlights the guitar and really showcases the product while making the viewer feel like they could be drawn in to become the rock stars in the pictures. The ads helped the game become the stuff of legends. 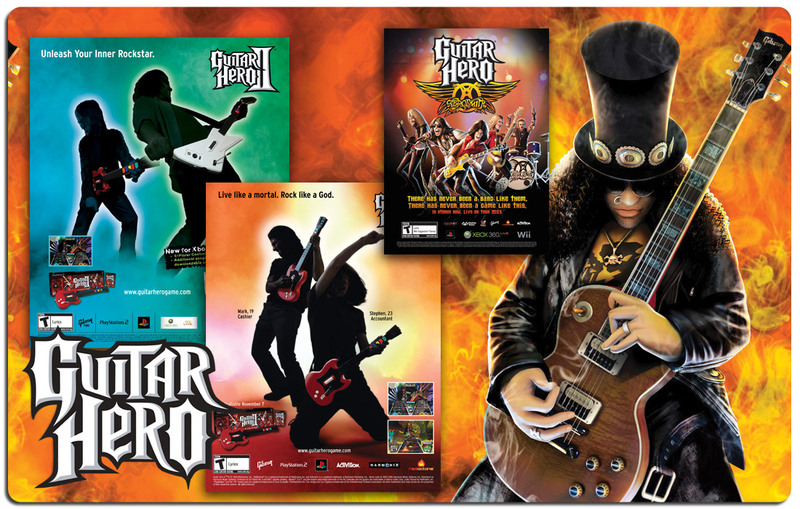 Several different versions of Guitar Hero were created and all sold very well. Spin-offs and knock offs like D.J. Hero and Rock Band were created. We eventually got to work with Slash himself. It made us very popular with our kids’ and their friends. Whether you have very specific ideas in mind or want to trust the experts and give us full creative license, you will be happy with the final project Modul8tion provides. Our bottom line is the same as yours: to move more product. We know that your new idea can be the beginning of something much, much bigger. And with that in mind, you will find we give the same high quality of attention to a new product that we would give to an established brand. Call us and let’s grow your product together.